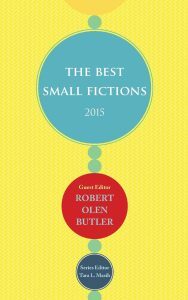 The Best Small Fictions 2015, Tara L. Masih and Robert Olen Butler, Eds. You are at:Home»Reviews»Book Reviews»The Best Small Fictions 2015, Tara L. Masih and Robert Olen Butler, Eds. Who could not be intrigued by a slim volume of bite-sized lies? These stories, selected by Tara L. Masih and her team, were nominated by a combination of journal editors, publishers, and two “roving editors” who hunted down gems that might otherwise have been overlooked. The result is THE BEST SMALL FICTIONS 2015, a gorgeous object in its own right. Its lemon yellow cover, designed by Brian Mihok, is delightfully retro and is a nod to the era in which the anthology’s ancestor, Anthology of Best Short-Short Stories, held sway (1952-1960), and to whose editor—Robert Oberfirst—this anthology is dedicated. The slim volume opens with a foreword from Masih which gives a clear account of the project’s genesis and selection criteria. Guest editor Robert Olen Butler’s lyric introduction follows (“A small fiction is a lone wolf of a lie, sometimes hounding the truth across a field but oftentimes simply sitting on a hilltop to raise its face to the moon and howl of love or loss” xiii), and leads into fifty-five finely crafted stories. Each is bookended: at its head, an attribution to the original publishing journal and the date of publication; and at its foot, the author’s biography. The anthology closes with a listing of finalists, interviews with Phong-Nguyen, editor of Pleiades, and Michael Martone, a contributor to the anthology, and with Butler’s biography. But back to the beginning. In his introduction, Butler urges the reader to “take your time with these, please. A few at a sitting. Read them slowly. They are small but brimming with our shared human experience.” It is good advice. In much the same way that a platter of barbeque ribs brings out the glutton in the best of us, this volume of miniatures tempts us to dive in and not surface until we’re full to bursting. But that would be a mistake. These tiny stories are like sushi—each one should be savored and time taken to consider its artistry. Let’s sample just a few. It’s interesting to note that a number are written in the sometimes problematic second person—problematic because this voice can become wearing to the reader after a while. But it serves these tiny bites perfectly. Yennie Cheung’s “Something Overheard” is a great example. Dealing with the voyeuristic intimacy that thin walls and close city living can bring, Cheung exposes our inability to reach out even when our neighbors’ pain is ringing in our ears: “It would be easy to walk next door and perform this small act of consolation in person, but you can’t. You shouldn’t. You won’t” (88). These fictions hand us our human condition on a literary plate. Masih shares the good news that these “short shorts” are back in vogue and that “academic programs are beginning to accept the teaching of this form” (viiii). She is spot on. At $14.95, this anthology provides both the instructor and the student with an affordable smörgåsbord of inspiration and models. I teach a creative writing class at Randolph College and would consider this a fine addition to a reading list for both the introductory and the intermediate/advanced level: each short short hands over an exquisite example of something finely done. Bunny Goodjohn, originally from the UK, now lives in Lynchburg, Virginia. She is the Book Review Associate Editor at Mom Egg Review, teaches English at Randolph College, and is the author of two novels (STICKLEBACK AND SNOW GLOBES and THE BEGINNING THINGS). Her first poetry collection, BONE SONG, was published in May 2015.